My mtDNA was tested and identified with what geneticists refer to as Haplogroup X, the most unique of all the groups. Xenia lived in the area that is now known as the country of Georgia, 25,000 years ago, right before the height of the last ice age. She probably had dark-blonde hair and blue-grey eyes. Georgia, at that time, was in the center of the tundra, a vast treeless grassy plain that stretched across most of Europe to Asia. It was a cold, windy, desolate area, with vicious blasts from the expanded polar ice caps sending the winter temperatures down to twenty degrees below zero for days or weeks at a time. Cold and inhospitable it may have been; but the tundra was also teeming with life and good things to eat. Massive herds of bison and reindeer moved slowly over the plains, feeding on the rich growth of grass and mosses. Smaller herds of wild horses were also there to be hunted. 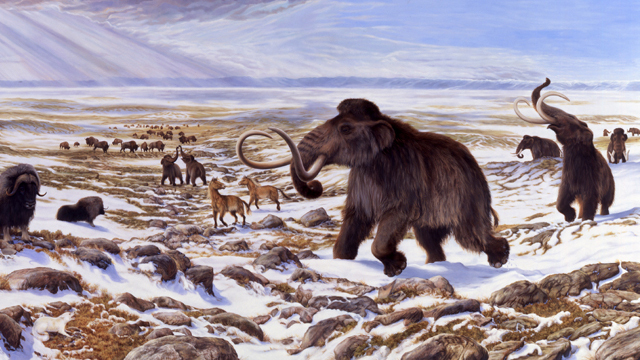 But the dominant animal was the gigantic woolly mammoth. Despite the fact that the land was also home to the cave bear and the saber tooth tiger, the mammoth had no enemies to fear. No natural enemies, that is, until Xenia’s human clan arrived. 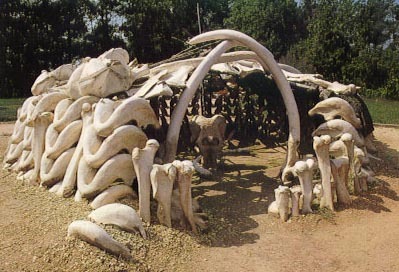 The clan lived in small round huts whose frames were constructed almost entirely of mammoth bones. Two gigantic tusks formed the door, which was covered by three layers of bison skins to screen the interior from the cold. The roof was padded with sod. There was no wood on the fire of the small hearth at the center of the hut. What burned in Xenia’s hut, and the first thing she ever smelled, was the sickly, unforgettable stench of scorched bone. The tundra was littered with the bleached skeletons of mammoth and bison. They made a reluctant and distasteful fuel, but suffering from foul aroma was better than freezing to death. Xenia’s clan was nomadic, moving from camp to camp, following the herds of bison and deer. There was no wheeled transport, not even sleds, so everything had to be carried. Anyone who was unable to walk – the sick, the old, the weak – was left to die. As the Ice Age ended, the animals, and Xenia’s descendants, moved north and west into Europe. Although only 6% of those currently living can trace their mtDNA to Xenia, traces of her DNA have also been found in a small percentage of Native Americans. 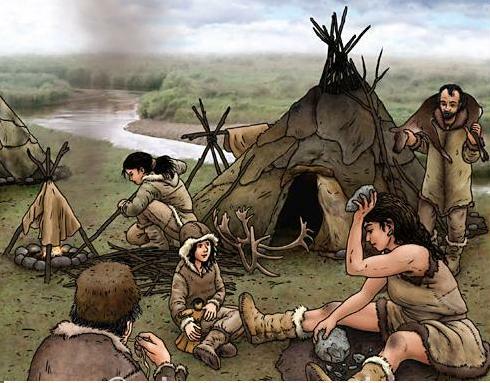 It has always been widely accepted that North and South America were populated by ancient migrations from Mongolia over a frozen land bridge connecting Asia with Alaska during several ice ages. But there has been no evidence of Haplogroup X in eastern Asia or Mongolia. But besides the small percentage of Native Americans, Haplogroup X also shows up in a small concentration in southern Spain and Northern Morocco. This has led to wild speculation that all of this is evidence of the existence of the fabled Lost Continent of Atlantis! Around 350 BC, the Greek philosopher, Plato, wrote about a “lost continent”, somewhere in the Atlantic Ocean, that was destroyed thousands of years before. 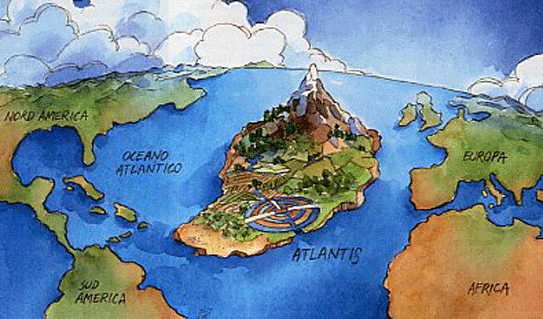 The theory is that the islands of the Caribbean and those near Africa, such as the Canary Islands, are the mountain peaks of Atlantis. Could Atlantis have been populated by descendants of Xenia? Is it possible that they fled the continent before it was destroyed, somehow making it to the Americas and to Spain and Morocco? Perhaps someday we will learn the truth.